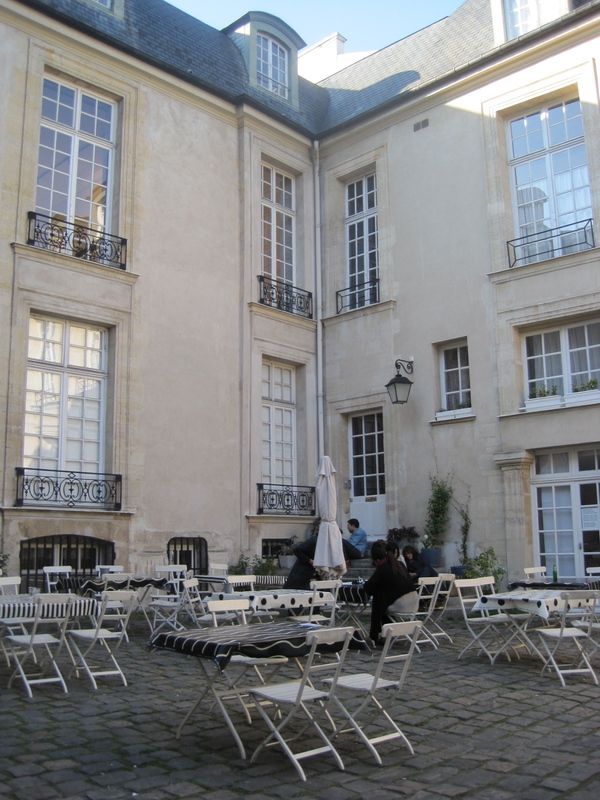 After a few months in Paris we developed our bearings in the neighborhood and I wanted to offer a list of places for an inexpensive meals in the Marais. When I say "inexpensive" I'm talking about food that is good but cheap by Parisian standards, certainly no more than 40 euro for two including drinks, but ideally far less. The Swedish Cultural Institute (photo above and below) is casual, simple and open all afternoon. It is only two euro for a cup of tea or coffee which can be supplemented by reasonably priced cakes, soup and open sandwiches. There is lovely outdoor seating in the warmer months. 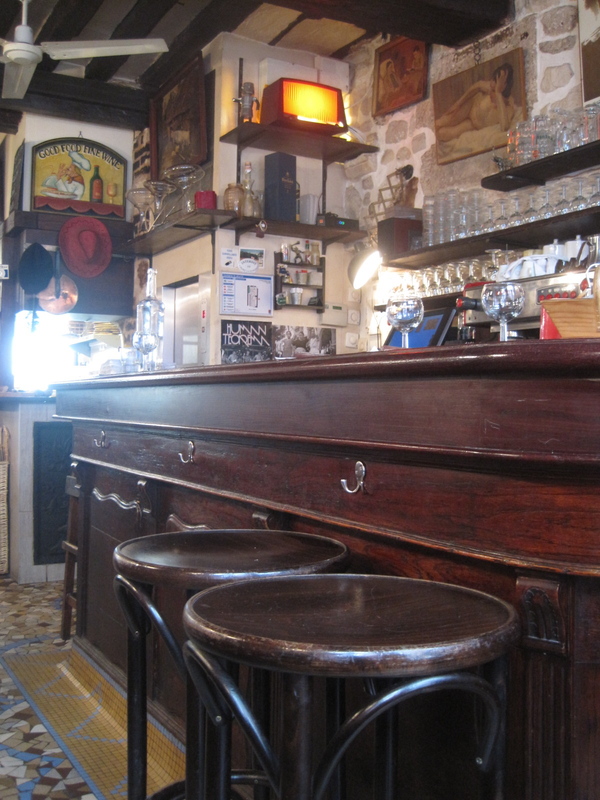 Chez Omar - The famous couscous place in the Haut Marais. The service is good, the food is simple and the portion are huge. You can easily share the main courses including vegetable couscous and chicken. It's cash only and they don't take reservations so you'll need to come early on the weekends. 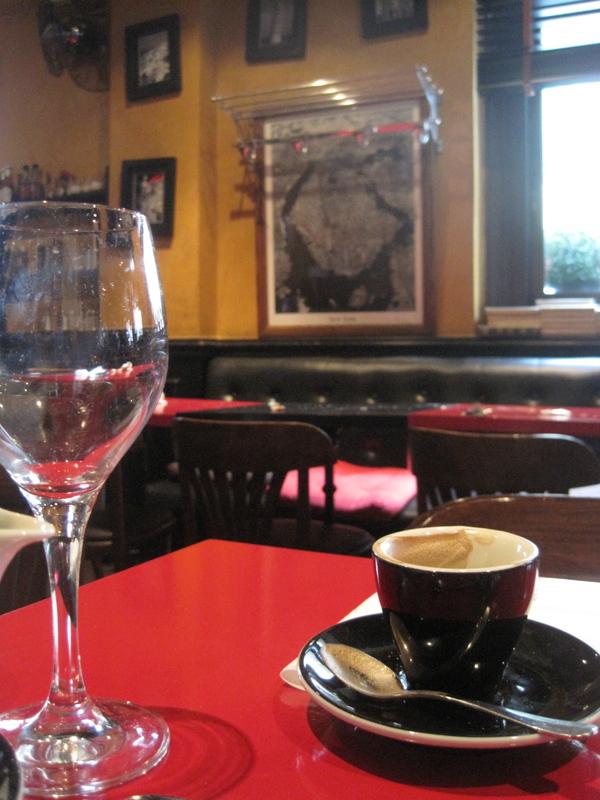 Robert and Louise at 64, Rue Veille du Temple is an excellent address for a modest lunch. 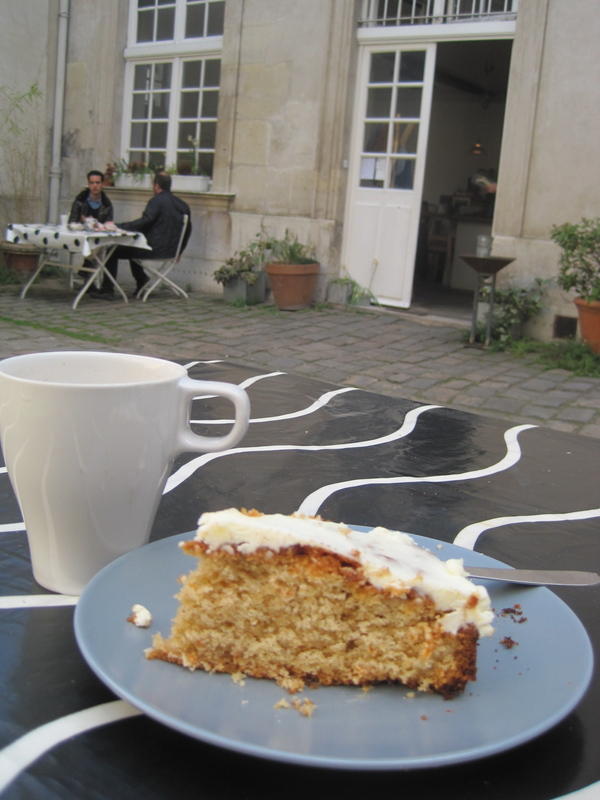 It's like finding a simple country restaurant in the midst of the trendy shopping mecca that is the Marais. With its gingham curtains, open fire and old fashioned bar this is the real thing, there's no need to add a faux patina here. The formulae for lunch is a bargain at 12 euro for two courses. I opted for the entree (tuna salad) and D. took the dessert option (creme brulee) As you can see (above) I had turkey cooked over the open grill for the plat and D opted for the beef bourguignon, both were delicious, flavorful and fresh. The meal was an excellent value and highly recommended at 30 euro including wine. The bar is photographed below. With the fire at the back of the restaurant, it's particularly attractive in the winter months or in bad weather. Falafel - I've mentioned our preferred Rue Rosier falafel place Mi Va Mi in another post. Open seven days a week it's just across the street from the crowds you'll see outside L'As du Falaffel. Yes it's cheaper to buy your falafel and eat it on the street but why not sit down in comfort? The wine is overpriced for the quality offered so we take two falafel pitas and a carafe of water for 15 euro. I aim to be here once a week. 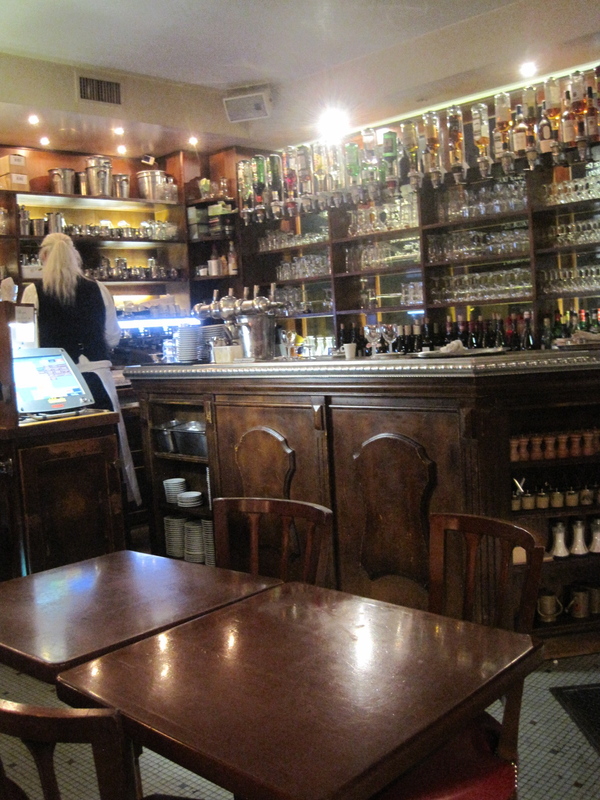 Les Philosophes - This popular place (photo below) is always busy and while there are lots of more expensive options on the menu you can always order the plat du jour for 12 euro. Add a 50cl pichet and you're still under 40 euro for two. It's open late and serves food all afternoon. Yesterday I had a late lunch at 4pm, the plat du jour was a duck breast with polenta and a fruit sauce. Another advantage is pavement seating which makes it a great place to people watch. Breakfast in America - Brunch seems to be THE new thing here in the Marais with may brunches starting upwards of 22 euro. I will not be paying that for breakfast, but if I'm missing the ritual of going out for breakfast this place may be the best option. A small slice of the U.S. near the St Paul metro stop, BIA (or Breakfast in America) is as described. This is a basic American diner breakfast (under 9 euro) served by American staff. It's cheap and cheerful, you'll get free refills on your coffee but they don't take reservations. 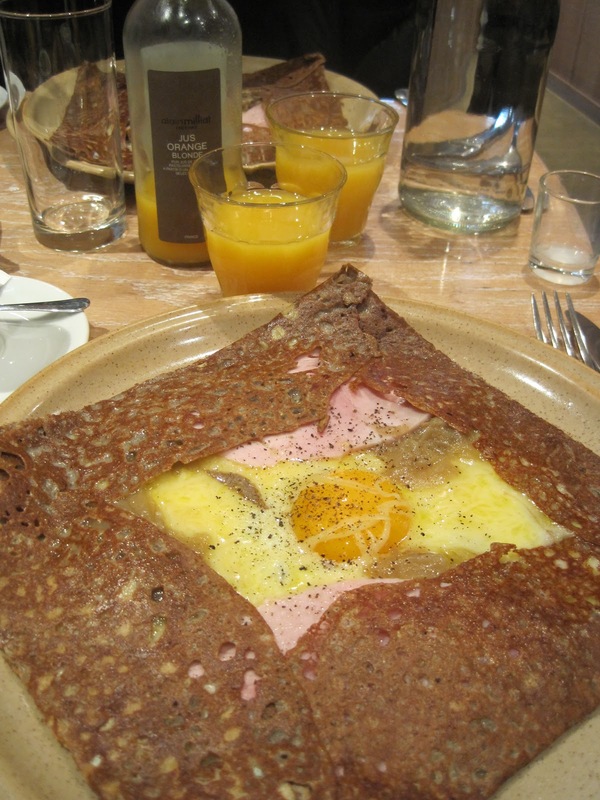 Breizh Cafe - Buckwheat crepes from Brittany served with cider. They opened at 11:30am and this is where I came for a late breakfast on my birthday. But be aware, you'll need reservations at night because they're very popular. Almost everything is less than 13 euro, with simple crepes with butter and lemon staring at less than four euro each. Fabulous combinations including cheese, ham, organic fillings and free range eggs, highly recommended and great for guests. Sushi Kyo - Less than 40 euro for two including miso soup, salad, two large plates of sashimi (chirashi pictured at the top) and wine. You could certainly eat for less if you're not as greedy as we are! 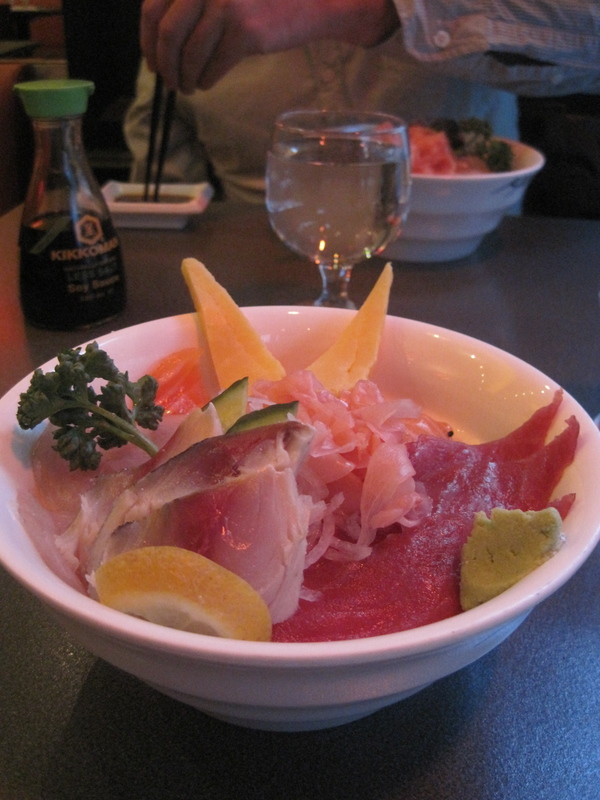 We don't understand it, but sushi (and particularly sashimi) is cheaper than we expected in Paris. We're not complaining, just stating a fact and consequently we're eating lots of it! The place next door has a different name, but it's the same menu and run by the same people. Outdoor tables in the summer make this an attractive, inexpensive option. Pizza Momo near the St. Paul metro stop was recommended on a trip report on Fodors' European forum and we thought we'd try it out. I like my pizza very thin - think Naples or Rome. This was an authentic wood fired pizza, good but not great. 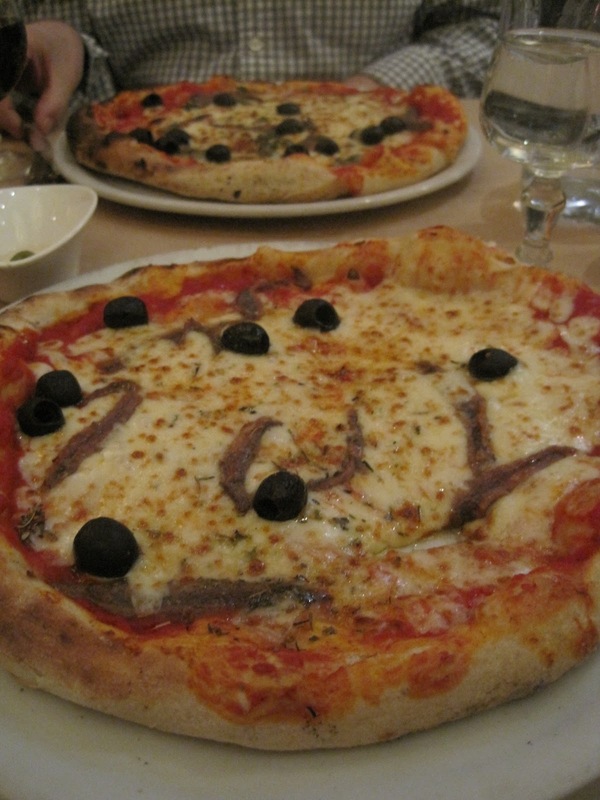 Overall a little doughy for me but still a good neighborhood option at just over ten euro per pizza. Tips - Of course eating your main meal at lunch is one of the most significant ways to reduce the costs of eating out as many restaurants offer good value lunch menus. La Perla at 26, Francois Miron offers a simple two course Mexican lunch for 8.90 euro including coffee! We always order "un carafe du l'eau" which is free and more environmental! WE were there for four months so it was good to have some economical options!